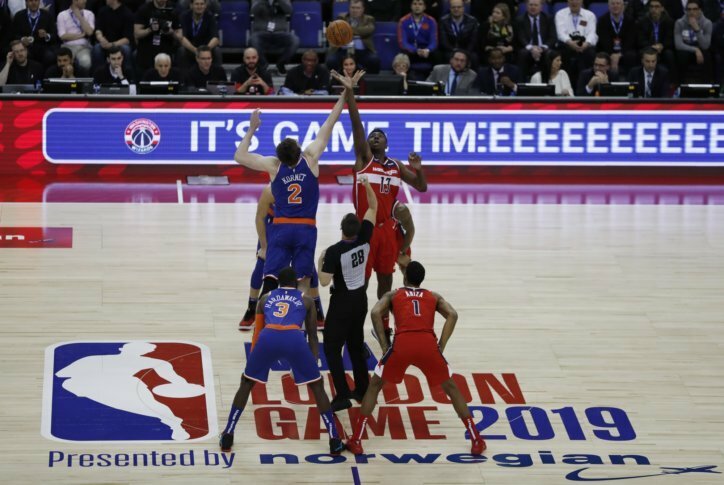 Thomas Bryant was awarded two points after Allonzo Trier was called for goaltending on his layup attempt with 0.4 seconds remaining, and the Wizards claimed a 101-100 victory over the New York Knicks at The O2 Arena on Thursday night. Beal scored 26 points and had nine rebounds and Otto Porter Jr. had 20 points and 11 rebounds for the Wizards, but it was Bryant’s bucket — or, more accurately, the one he didn’t make — that mattered most. Beal, who worked out with Bryant in Los Angeles during the offseason, said he didn’t hesitate dumping the ball off at the last second. It then led by as many as 16 in the third quarter before Washington began to rally. The Wizards reclaimed the lead at 92-91 with 4:34 left on Porter’s pull-up jumper. Knicks: C Enes Kanter, who is averaging 14.4 points and a team-high 11 rebounds, did not travel with the team for the game because of fears over his safety as an outspoken critic of Turkish President Recep Tayyip Erdogan. … Rookie C Mitchell Robinson returned after missing 13 games with a groin injury and finished with four points and two rebounds in 10 minutes.